Can you count your money? This math worksheet will give your child great practice with money amounts. 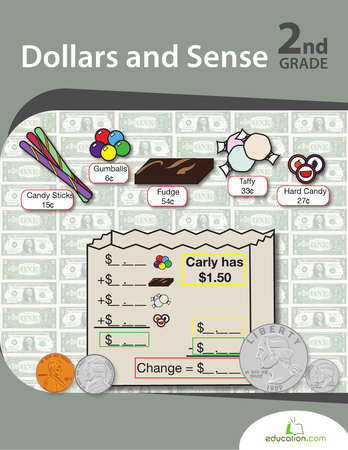 Introduce your child to real world math problems with this practice money. She can color these bills, and get familiar with currency the fun way. Assist your little financier with adding coins. She'll add up coins in her head and tally the amount to figure out the price of the item shown. Shoes and subtraction go hand in hand on this money math worksheet. These word problems familiarize your kid with the concept of money. Your child will read values in words and then write money terms out in numbers in this money worksheet. She'll get practice using and recognizing numbers too. 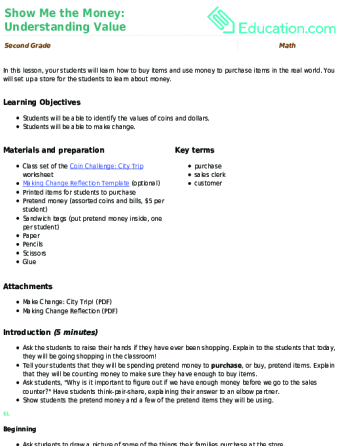 Use this glossary with the EL Support Lesson Plan: Purchasing Items and Making Change. This money worksheet let's your child practice reading dollar values in words and then writing money terms out in numbers. This math worksheet let's your child practice reading monetary values in words and then writing money terms out in numbers. Count your money carefully kids! This math worksheet will give your child great practice with money amounts. 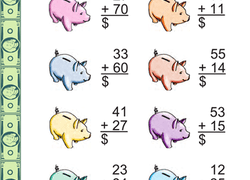 Solve two-digit addition problems with piggy bank math. Find out how much money is in each piggy bank with this math worksheet. Help your child get money-wise. This math worksheet will have him reading money values in words and writing out the amount in numbers. Practice writing money amounts with this worksheet! 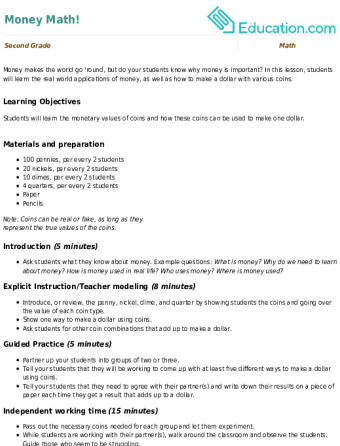 Your student will work on translating written numbers from words into numerical digits.